Mobile billboard parked in residential area of West L.A. 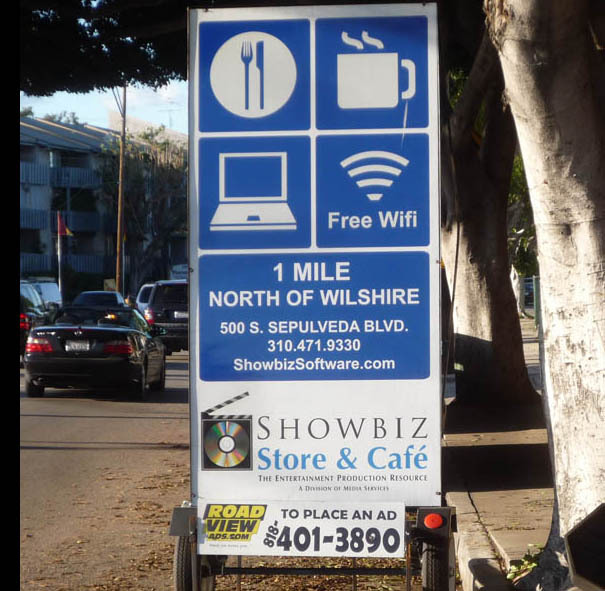 The city of L.A. finally has a tool to fight the growing scourge of mobile billboards taking up parking spaces and creating visual blight on the city’s streets and boulevards. Yesterday, Governor Arnold Schwarzenegger signed a bill that gives California cities the power to ban such forms of outdoor advertising. The bill, co-sponsored by L.A. area assemblymembers Bob Blumenfeld and Mike Feuer, came after L.A. city council members were flooded with complaints about the billboards mounted on trailers and parked for days in prime locations. Led by Councilman Dennis Zine, whose west San Fernando Valley district has been particularly hard hit, efforts to prohibit the signs have been hampered by legal issues that the bill was designed to resolve. While the city is expected to act quickly on an ordinance banning the billboards, at least one operator has promised to sue to stop what he calls an infringement upon his company’s constitutional rights. See videos below for more on the issue.